A pet chameleon requires a fairly elaborate habitat and will need the correct cage, decor, humidity, and care in order to be happy and healthy. An additional benefit to having an appropriate habitat is that your pet will be more active and entertaining. A chameleon cage can be a tall glass terrarium with screened top, a screened or wire cage, or even a large and tall bird cage. Glass terrariums do provide better temperature and humidity control and may be better suited for those living in dry or cold climates. 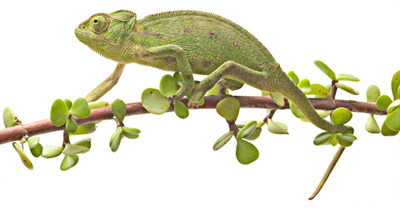 For chameleons a foot or less in length the cage should be at least 2′ x 3′ x 3′. Bigger is always better so go with the largest and tallest cage possible. Chameleons can also be kept in the home without a cage if you supply a tree as a habitat. The Ficus Tree is one of the best trees for a home. It has suitable branches for walking, leaves for drinking, does well indoors, and is readily available at plant nurseries. A cage-free chameleon is not recommended if you have other pets like cats or dogs. If you pick a different type of plant, make sure it is not toxic to your chameleon since he may nibble on the leaves and bark. You should also wash and rinse any plant and its leaves with soapy water to remove any pesticides that may have been sprayed on it. It is also possible to combine a cage and the Ficus Tree to create a natural and safe habitat. You would need a screened cage large enough to completely cover the tree. You may be able to find a commercial cage large enough or you can make one from wood and mesh screen inexpensively. If you don’t use a Ficus Tree for your pet’s home, you will have to provide places for him to climb and drink. He will need a variety of horizontal branches where he can sit and climb. The cage will also need a bunch of leaves from which your chameleon can drink droplets of water. The leaves also create areas where he can hide and rest. There are a variety of artificial leaves, bendable branches, and other reptile decor available that have been designed for habitats. Your chameleon will need a source of UVB lighting. Fluorescent UVB bulbs work well and ensure that your pet gets enough exposure. You want to make sure the lights are located where your pet can’t get too close and possibly burned. A source of heat may also be needed to maintain the cage temperature. Basking bulbs and heat emitting bulbs are a good way to provide additional heat. They also focus most of the heat in one area creating temperature gradients in the cage which help the chameleon regulate heat by moving around. A food bowl will be needed for insects like mealworms that your pet eats. The food bowl should be located where your chameleon spends most of his time. A bowl that can attach to the side of the cage or a branch and won’t spill works best. A source of water will also be needed. A dripper slowly drips water onto leaves and other items where your chameleon can drink. It also indirectly waters the Ficus Tree if that is where your pet lives. A mister or fogger is an excellent choice if the cage is in an area with low humidity. A mister on a timer will spray the leaves and cage with a mist creating droplets of water as well as raising the humidity. It is recommended that you have a thermometer and humidity gauge. Maintaining an ideal temperature and humidity level is important for your chameleon’s health and well being. Many do well with around 50 – 70% humidity, but it varies by species. The substrate of your pet’s cage can be as simple as newspaper or paper towels or as realistic as Eco-earth. Whatever substrate you use should make cleaning up debris and waste easy. If your pet lives on a Ficus Tree, a large pot for the plant and its potting soil may be sufficient.